This is the first part of a 3 part blog/screencast on creating an end to end application that scrape data of a source and then re exposed these data as RESTful web services. In the first part, we will look at pulling data into our web application. 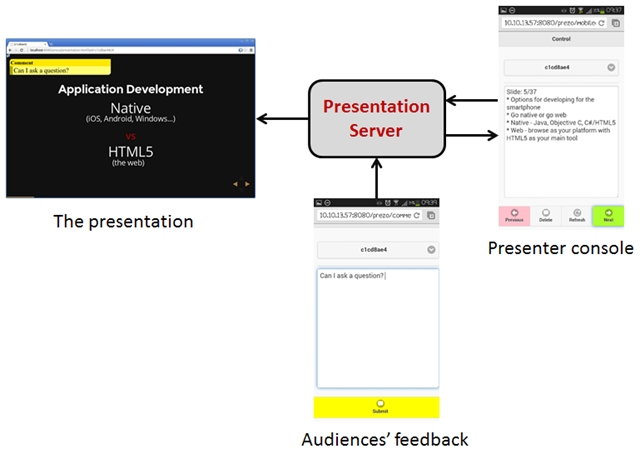 In the third and final part, we will write a mobile client to consume the web services. 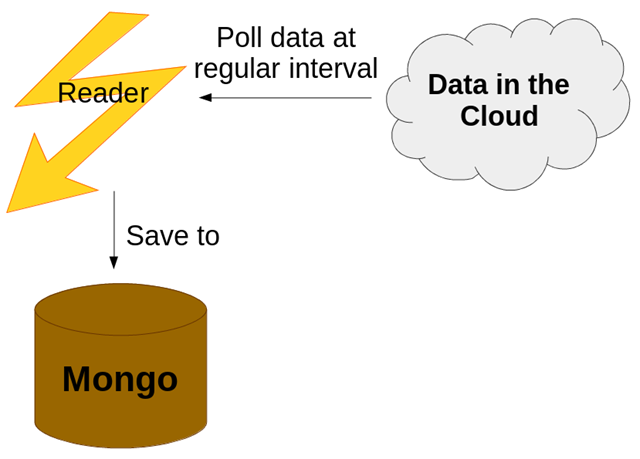 The technologies that we will be using will be JavaEE 7 (tutorial), Mongo database and AngularJS/Ionic on the front end. The feed is read at regular interval. This feature is implemented using JavaEE 7’s ManagedScheduledExecutorService which is a thread pool managed by the application server. JavaEE application servers supports the concept of connection pooling, in particular database connection pool. However this support only extends to RDBMS. So if you’re using NoSQL databases, then you’re out of luck. One solution is to implement custom resources like this particular example for Glassfish. Luckily for us, MongoClient, the Mongo’s Java driver has an internal pool (and is thread-safe!). So we can create one instance of MongoClient and get this instance to dish out connection as and when its required. To using this instance as a singleton, we use CDI to wrap it in an ApplicationScoped object. This ApplicationScoped object ensures that only a single instance of MongoClient is created and used throughout the entire application. The following screencast shows how we create the a JavaEE web application, read RSS feed from BBC Football website and save that into a Mongo database. In my previous blog I describe how we could add additional security layer to Java EE’s login process. The application server holds a set of valid username/password; users are authenticated against this set of credentials. Managing username/password is hard work; what if you are only interested about the user but not necessarily in maintaining the user. If your security requirement is not that stringent, then I could let somebody that I trust validate that user. Once the user is validated, I can find out about the user. So you don’t maintain any username/password database. 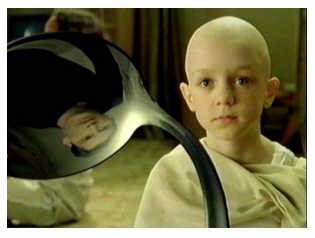 As far as you are concern there is no user. Enter OAuth; it is a standard at allows an application to access data that a user holds in a 3rd party application. In order to access the data, the user first have to authenticated into that 3rd party application; once we pass the authentication stage, then we are authorized to access the data. The really nice thing about OAuth is that you never have to reveal your username or password to the application. A use case might be an application would like a user’s valid email; one source of this might be from Google. So by using OAuth, the user can authorize Google to release this piece of information to the application. For more details on OAuth watch this video. 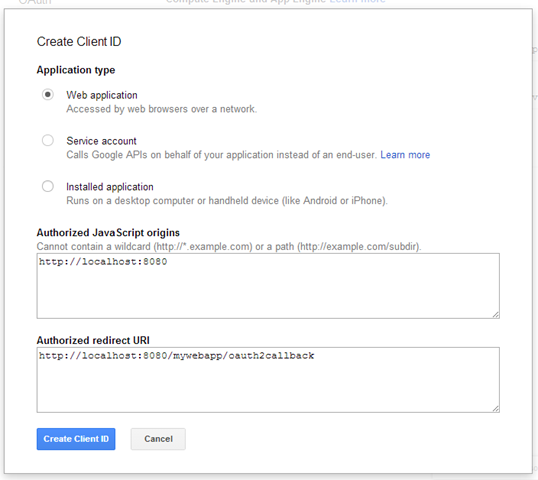 how to integrate/use Google’s OAuth2 as our authentication mechanism for a web application. An user Fred, attempts to access some restricted resources/page on the JavaEE application. The JavaEE application server determines that Fred need to first login. The web application redirect Fred to Google’s login page. Fred proceeds logins to his Google account; if Fred has already login to his account, then he will not need to relogin. 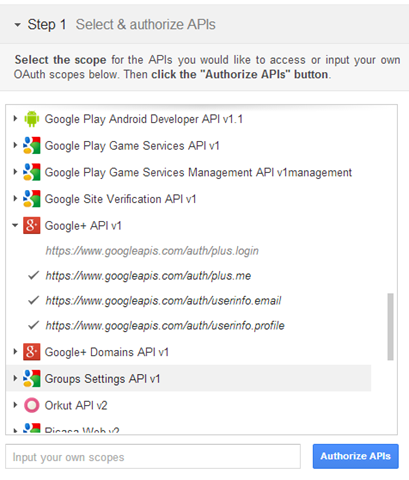 After Fred has successfully login, Google OAuth2 provider will display the consent page. The consent page provides details about the web application and more importantly what resources is it trying to access, eg Fred’s email and Google+ id, his drive, etc. Now lets look at these steps in greater detail. The first thing you’ll need to do is to create a project using Developer Console. This project is our JavaEE’s representation in Google’s universe. When a user gives permission to our JavaEE application to access his email, the user is actually giving permission to this project. In the example above, my project’s name is Gatekeeper and the project id is gatekeeper-sg1. Go into the project by clicking on the project’s name. On the left hand side, expand ‘API & auth’ menu item and you should see APIs, Credentials and Consent Screen. To create client id, click on Credentials, followed by clicking on CREATE NEW CLIENT ID. The above shows the newly created client id. We will need the Client ID, Client secret and Redirect URIs later when we write our web application. One final, you can customize the consent screen by entering the web application’s url, image, T&C, etc under the Consent screen menu. Assume we are going to get basic detail about a user from his Google+, so let see how we do this using playground. Open up playground. 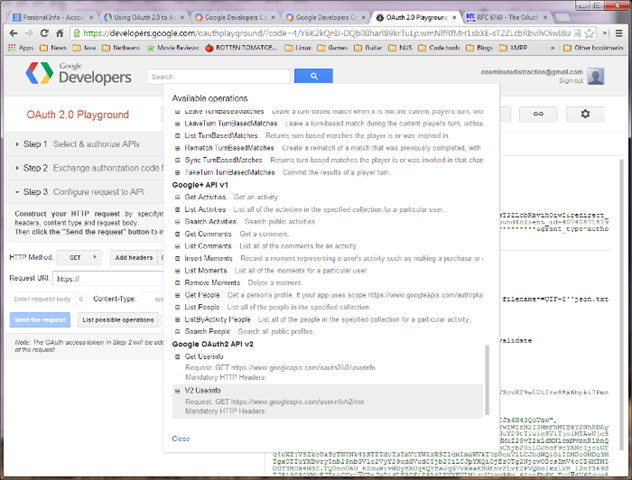 Under Step 1, look for Google+ API v1 (don’t forget to enable it in your application). Under that you will see list of information accessible. Select the information that the application will need to access; what we are saying here is that if a user eg Fred logins to our web application, then Fred will have to provide these information to the web application. The consent page will display these details. So check whatever details you want to access. As a best practice, ask for the minimum amount of information in order for your application to establish a trust relationship with the user. The URL that you see are the scopes. Make a note of these eg. if the example on the left, I have 3 scopes: https://www.googleapis.com/auth/plus.me, https://www.googleapis.com/auth/userinfo.email and https://www.googleapis.com/auth/userinfo.profile. Once you’ve selected all the API, click on the Authorize APIs button. This is to authorize playground application (for testing) to access these resources from your Google account. If you’re using this the first time, then you’ll probably see Playground’s consent screen requesting permission to access to API from Step 1 above. Click on Accept to proceed. If you don’t then you cannot test those APIs. Once you’ve consented, you’ll be taken to Step 2. Nothing much to do here except to click on Exchange authorization code button which will now take you to Step 3. We are now ready to test the Google+ API. Click on List possible operations button. Depending on what you’ve request in Step1, you will now be presented with a list of URL that you can call. Select Userinfo (in our case) from the list then click on Send the request. We now have everything we need from the OAuth provider, we will now look at how to add this to our web application. Start by configuring your web application to use form based authentication. You should provide a login page with a button to login via Google. You could also provide the option of using the traditional way of login with j_security_check. GooglePlusServlet is the servlet that will handle the OAuth login.Google has documented the authentication exchange here. I’m however going to using the excellent Scribe library. From the ServiceBuider we lookup Google’s OAuth2 Provider class. Once we have the OAuthService, we need to set the client id, the client secret and the URI callback . 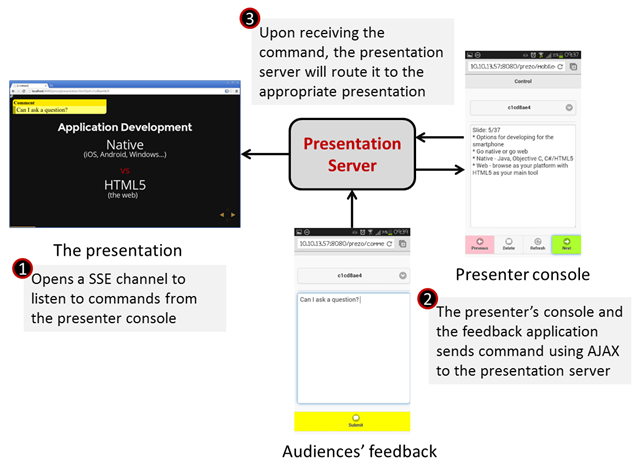 All these 3 pieces of information must match the project we created earlier. Next comes the scope information; scope is use to indicate to Google what resources are we interested in accessing. In other words what is the scope of this request. The scope in this case must always start with the string openid followed by a space delimited scope namespaces. The 2 standard namespaces are profile and email. If we just have those 2 namespace, then we are saying that we are interested in the user’s profile and email. Google supports additional scopes for its services. This is where playground comes in. If you recall, when we were exploring the API, we are also shown the scope. If we want the request to access the user’s G+ profile and circles, then add their scope namespaces to the scope() method as shown above. Note: Scribe supports may OAuth providers out of the box. However Google is NOT one of them; the reason is found here. This gist adds support for Google. Add the Google2Api class into your project and you’re good to go. After constructing OAuthService, save that in the session cause we’ll be using it in the next phase of the authentication. If you are not login to your Google account, you will now be asked to do so. If this is the first time you are using the web application, you will be shown the consent screen. You can now choose to accept or reject. Once you’ve consented to the request, this permission is saved into the user’s account permissions. The callback is routed to this servlet; we check if the user have rejected the request. If not we proceed to get the user’s details. I’m using an async servlet here because we’ll be making request out to Google for the user’s info and we do not want to hold on to the request processing thread. If the user have consented to the request, then get the code from the query string. This is the most important parameter. Using the code we construct the access token. For every request to Google, we will need the access token to use the token to sign it. Constructing a new token is quite straight forward. You can also refresh an old token by passing in the token as the first parameter in getAccessToken(). Once you have gotten your token, save it in the session. We are now ready to get the user’s profile. For your experimentations in the playground (step3), you now know which URL to use and what HTTP method to use. Construct that using OAuthRequest class. Sign it with the token, before making the call. When the response, returns parse it using a Json parser. Since I’m using EE7, I’ll be using the Json API to perform this. Again, from playground, we know the structure of the Json response from Google. You can now save all the relevant information. One last thing before we end. 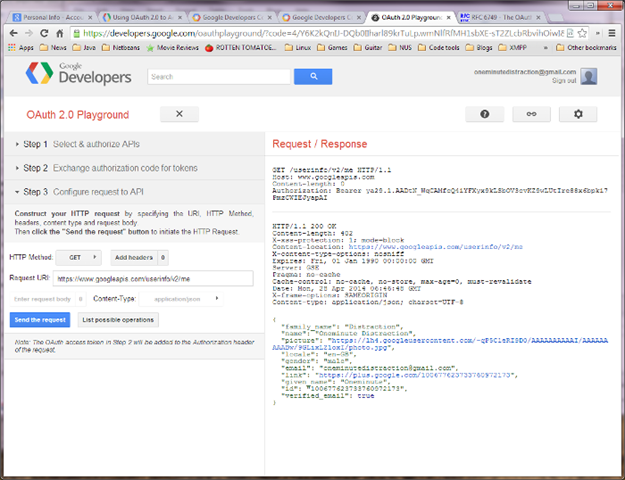 So we have successfully authenticated with Google using OAuth. But we have not login to the application. To do that, I’ve decided to create a proxy user in the authentication realm of the application server. After you have authenticated with Google, login to this proxy user so that the application server will honour all the security declarations. Just be aware that you cannot use getRemoteUser() or use getPrincipal() to get a user’s detail. A more tightly integrated approach would be to develop a custom realm (Glassfish in this example). However custom realms may not be portable. Write a servlet to construct an OAuth request. JSONP is typically used in cross origin AJAX calls using the GET method. You can learn more about JSONP from this Stack Overflow discussion. The JSON-P website talks about why and when it is used. Notice that the callback function name is in the query string of the request. The code is quite straightforward. We inject the callback query string into the handler which we subsequently use to wrap the result. As you can see, its quite simple to handle JSONP. JAX-RS has a pair of SPI call MessageBodyReader and MessageBodyWriter that allows anyone to handle marshalling and unmarshalling of objects from HTTP to JAX-RS resources. I wrote a simple MessageBodyWriter , called JSONP4JAXRS, that simplifies the entire process (if you don’t mind adding 12K to to your project). No more fiddling around with callback parameter. The MessageBodyWriter will automatically pad the JsonObject with the callback. Don’t forget to wrap your Iterable (eg. List<JsonObject>) in a GenericEntity if you are returning the result via a Response. JSONP4JAXRS works with Java EE 7 only. JSONP4JAXRS can be downloaded here. The source and binaries are in the compile NetBeans project file. The binaries is in dist directory. They say third time is a or should be charm! In this blog, I’ll talk about Vorpal2, a reworked version of Vorpal. The original Vorpal grew out of an experiment and the framework was implemented on top of AbstractComponent class from Tinder. It was a really easy way for someone like me with very little knowledge of XMPP to learn about XMPP and get the framework up and running. However due to the way AbstractComponent class works, I had to repeat a same piece of code in different places. There is no single choke point for the XMPP packets coming in and leaving the framework (for that I had to modify AbstractComponent which was not very appealing); this make implementing certain features extremely difficult and in some cases impossible. The second issue was that I made the framework dependent on a custom Glassfish container call Jabberwocky. Whilst Jabberwocky is great in that it provided a very robust base to run the framework, integrated extremely well with Glassfish asadmin command and provided all sort of statistics on a Vorpal application, the down side was that it effectively ties Vorpal to Glassfish. Also Jabberwocky is build with Maven. So whenever there is a new release of Glassfish I have to figure out which dependencies have change, etc. Finally testing the framework engine’s becomes difficult because of the 2 dependencies above. So I’ve decided to reimplement Vorpal; the good news for me is that most of the framework is fine. I just have to rewrite how the Vorpal is loaded. I’ve removed Vorpal’s dependence on AbstractComponent and Jabberwocky; the startup is now done in ServletContainerInitializer. Its lightweight and in theory should run on any JavaEE 6 Web Profile compliant container. Glassfish will still be the best supported platform simply because this is where I develop and test Vorpal. For the rest of this blog, I’ll talk about migrating from Vorpal to Vorpal2, packet filters which is a new feature available only in Vorpal2. I’m happy to say that there are no code changes going from Vorpal to Vorpal2 but if your application uses ComponentManager then you’ll have to rewrite that portion of it. ComponentManager is an artefact of AbstractComponent. In the past I’ve allowed you to inject ComponentManager into your message handlers. This is no longer true; all the functions in ComponentManager can now be found in ComponentContext. If you have been using Vorpal, you’ll need to uninstall them. Delete jabberwocky.jar and jabberwocky_support.jar from $GLASSFISH_HOME/glassfish/modules directory. As before, vorpal2.jar must be bundled with your application in WEB-INF/lib. There are 2 ways you can install jabberwocky_support2.jar. You can either bundle that with your application in WEB-INF/lib or install it at your application’s CLASSPATH. For Glassfish this will be the $GLASSFISH_HOME/glassfish/modules directory. At the writing of this blog, I’ve not fully migrated the NetBeans plugin to support Vorpal2 (hence the missing update directory from the download bundle). Hopefully I’ll have the plugins done by the next release. 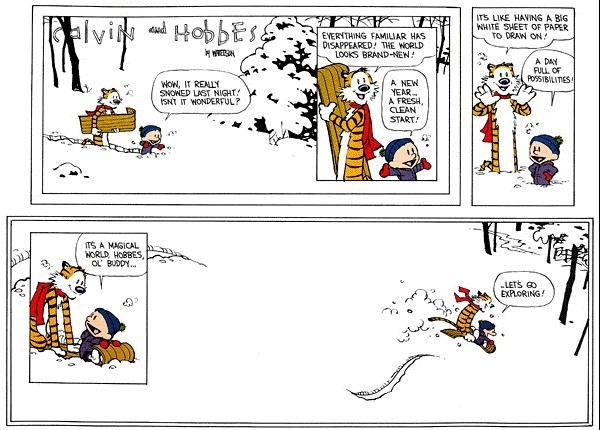 In the mean time, you’ll have to manage the build and package yourself. In NetBeans, add the the JARs from the bundle to your project’s library and remove the previous version of the libraries. Also remember that these JARs, or at the minimum vorpal2.jar, must be in WEB-INF/lib of the final WAR file. Vorpal uses a deployment file to connect to an XMPP server. The file is called xep-0114.xml. This file is found in WEB-INF directory. If you’re developing Vorpal applications with the NetBeans plugin, the template of this deployment file is in your project directory and its called xep-0114.txmlt. Always specify the shared secret with create-domain. The create and cleanup attributes must be present but their values are ignored. Recompile your application after you’ve made these changes. Packet filtering is one of the feature that I wanted to implement into Vorpal. But I could not do this easily under the old code base until now. Firstly we see that our filter is annotated with @PacketFilter and implements RequestFilter. So what this mean is that this filter will only monitor incoming packets viz. packets sent to the Vorpal application. Filters are managed by CDI. so you can injected values into it. In this case we are injecting the domain name that the subcomponent is connected to. Filters are statesless so you should not use any CDI scopes on it. In the filter, you can do anything to the packet; you can add stanzas, remove stanzas and change certain values in the packet. When you return a packet, this can be the original packet from the parameter or a totally new packet, Vorpal will take the packet and proceed with finding an appropriate handler. If you return a null, then Vorpal will discard the packet. A ResponseFilter behaves the same way as a RequestFilter. When you implement ResponseFilter, you have to override the outgoing(Packet, ComponentContext) method which returns a Packet as well. If you return a null, then Vorpal will not send the packet. If you have more that one request or response filter, Vorpal does not impose any ordering on them. Also if one of the filter rejects a packet, then that packet will not be processed by other filters. For example if you have 3 request filters; the first of these 3 filters rejects the packet, then that packet will not be passed to the other 2 to be processed. handle() returns a List; so Vorpal will send out the packet according to the order of the packets in the list. Let me know what you think of Vorpal2. If you have any issues, please post them to the forum. The new bundle can be found here. the identity (<identity>) of the JID as defined in the Service Discovery Identities. You use the information here to determine what exactly is the JID. If you are looking for a pubsub service, then the category should contain pubsub value. the feature (<feature>) that is supported by the identity. In the case of a pubsub, these can be features like ability to create/delete nodes, persist items, etc. A list of the pubsub features can be found here.